Tunisia is an established oil and gas producer with production since 1966 and current output of approximately 100,000 boe/day. The country benefits from a low OPEX environment with significant presence from oil service providers in the region. 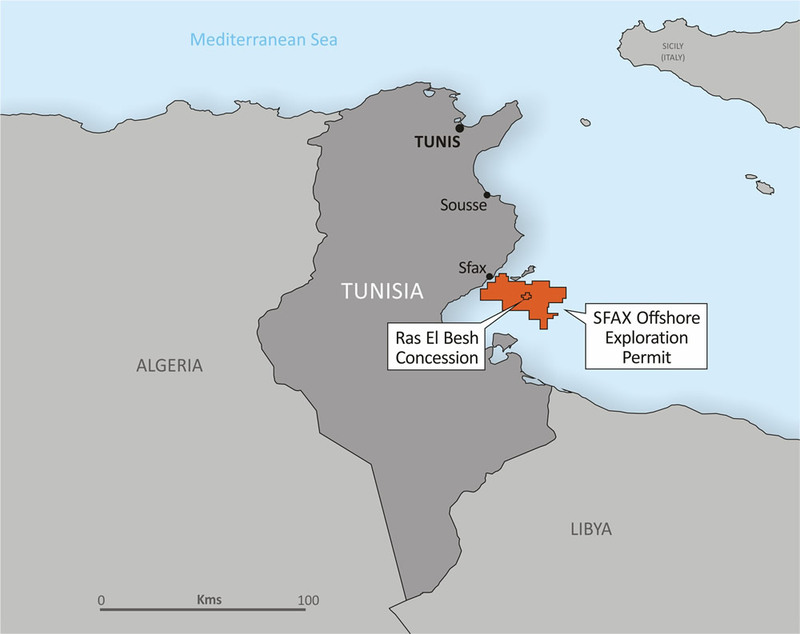 The Sfax Offshore Exploration Permit, containing the Ras El Besh Concession, lies in the prolific oil and gas Cretaceous and Eocene carbonate platforms of the Pelagian Basin offshore Tunisia. In the vicinity of the Permit area are numerous existing producing fields with infrastructure and spare capacity in pipelines and facilities. The Permit is operated by Panoro Tunisia Exploration AS and Panoro’s current interest in the license is 52.5%(1). There are three oil discoveries on the permit, Salloum, Ras El Besh, and Jawahra, with gross recoverable oil estimated by the former operator of 20 million barrels. In addition to these discoveries there is considerable exploration potential in the Permit, and the previous operator’s P50 unrisked gross estimate was 250 million barrels. The TPS Assets comprise five oil field concessions in the region of the city of Sfax, onshore and shallow water offshore Tunisia. The concessions are Cercina, Cercina Sud, Rhemoura, El Ain/Gremda and El Hajeb/Guebiba. The oil fields were discovered in the 1980’s and early 1990’s and have produced a total of around 54 million barrels of oil to date. The current production is stable at around 4,000 barrels of oil per day. Approximately 50 wells have been drilled in the TPS fields to date, whilst some of these wells have been abandoned, 14 remain on production with 5 wells currently shut-in awaiting workovers or reactivation. Two wells are used for disposal of produced water. Production facilities consist of the various wellhead installations, connected via intra-field pipelines to processing, storage and transportation systems. Crude is transported to a storage and export terminal about 70 km south of the Assets at La Skhira. Panoro’s equity participation in Tunisian operations and companies, as described above, is in partnership with Beender Tunisia Petroleum Limited (“Beender”) whereby, Panoro effectively owns 60% and Beender the remaining 40%.